Disclaimer: This post contains affiliate links. The wonderful people at Universal Yarns provided the yarn for this review. I was not required to write a positive review. These opinions are 100% mine and are not biased in any way. “A high quality worsted weight yarn with a rich, vibrant palette of colors. Uptown’s anti-pilling acrylic makes it a great choice for soft, wearable projects you’ll treasure for years!” See more on their website HERE. The words “anti pilling” interest me so when I saw Universal’s Uptown was made of anti pilling acrylic I knew I had to try it. I looked up how anti pilling acrylic is made I found a patent that basically described the chemical process. I wont bore you with the details so let’s just dive into the yarn! Uptown comes in several bold and beautiful colors. Looking online I found some great prices (as low as $4 a skein!) so that’s a definite plus. On first inspection the worsted is on the thicker side and a bit dense but oh so soft and smooth to the touch. I could tell it would make for something plump and cozy. It’s a 4 ply yarn with a medium to tight twist. When you untwist the yarn it quickly springs back which tells me when worked up it will have wonderful stretch that will also spring back. Uptown worsted was wonderful to work with. It effortlessly glided over my hook and needles. I found no knots in the skein I used for my sample swatches and the thickness was very consistent. I had no issues with splitting. I found with my knit swatch that purl stitches really popped which was fun. When worked it was plump like I thought it would be and it was fun to play with different textures. The swatches responded pretty well to steam blocking but I got the best result by just throwing them in the wash. They were a but dense and stiff at first but after washing they draped nicely. Even though the yarn was already really soft to begin with it got even softer after washing. I washed and dried a swatch a total of 5 times. In between each wash I rubbed the swatch together so it saw quite a bit of wear. I was skeptical but I see NO pilling! A VERY slight halo/fuzz developed but after the amount of washing I did I expected to see a lot more. I was impressed! Uptown would work beautifully for so many things and because it also comes in DK, sport AND bulky the possibilities are almost endless. Blanket, sweaters, slippers, hats, mittens, socks…I could go on and on. It would also be great for something that uses colorwork. Whatever you make it will be warm and cozy. 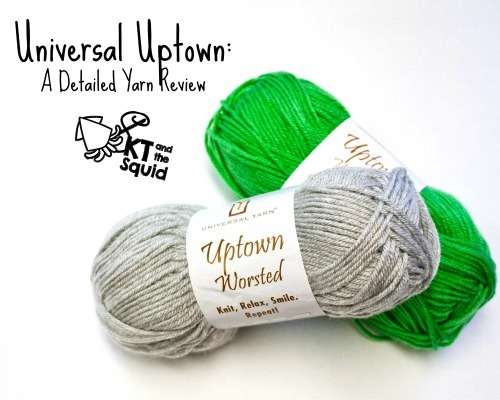 Uptown is a yarn that will stand up to lots of wear and washing. Great for babies and for gifts. If you are allergic to wool this is a great alternative! It works up easy and if blocking is not your thing it’s perfect. I would recommend this yarn to knitters and crocheters of every skill level. It’s great for beginners but also a high quality yarn that even the more advanced will love. One of the best thing is it’s AFFORDABLE! You can also see more projects made with Uptown by viewing it on Ravelry HERE.